Based on thousands of interviews with successful grad students and graduate admissions officers, Graduate Admissions Essays deconstructs and demystifies the ever-challenging and seemingly more impersonal application process for getting into graduate and scholarship programs. 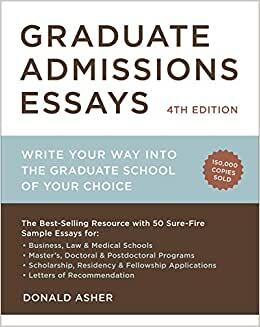 The book presents 50 sample essays in a comprehensive range of subjects, detailed strategies that have proven successful for some of the most notoriously competitive graduate programs in the country, as well as sample letters of recommendation, essays for residencies and fellowships, and postgrad applications. DONALD ASHER is one of the nation’s foremost authorities on higher education, the transition from college to career, and the admissions and graduate admissions process. He tours more than 100 college campuses annually, lecturing and teleconferencing to hundreds of thousands of students and faculty. He is the author of 12 books.